According to data from the U.S. Census Bureau, 40 million immigrants resided in the United States in 2010, which is the highest number in history. Furthermore, 13.9 million immigrants have come to the U.S. since 2000 making the 10 years from 2000 to 2010 the highest decade of immigration in U.S. history. Immigration to the United States is the primary force behind population growth, and if our current immigration laws are not changed, the population of the U.S. will grow from its current 312 million to 459 million by the year 2060. Immigration into the United States fluctuated throughout the 20th century because of varying economic conditions. But the changes made by the Immigration Reform and Control Act of 1986 drastically increased the number of legal immigrants into the United States. Plus, the bill signed into law by then-President Reagan, provided amnesty to 2.7 million illegal aliens without improving or increasing interior enforcement to discourage future illegal immigration. The nation's immigrant population has doubled since 1990 and quadrupled since 1970 when only 9.7 million immigrants resided in the U.S. The chart to the right shows the sources of the population growth. The green section represents current native born Americans, whose population levels actually decrease over time because of less-than-replacement level fertility rates. 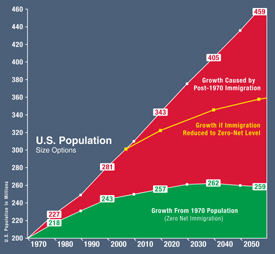 The red section represents population growth caused by current and future immigrants. SOURCE: Center for Immigration Studies, "A Record-Setting Decade of Immigration: 2000-2010", Dr. Steve Camarota, October 2011.